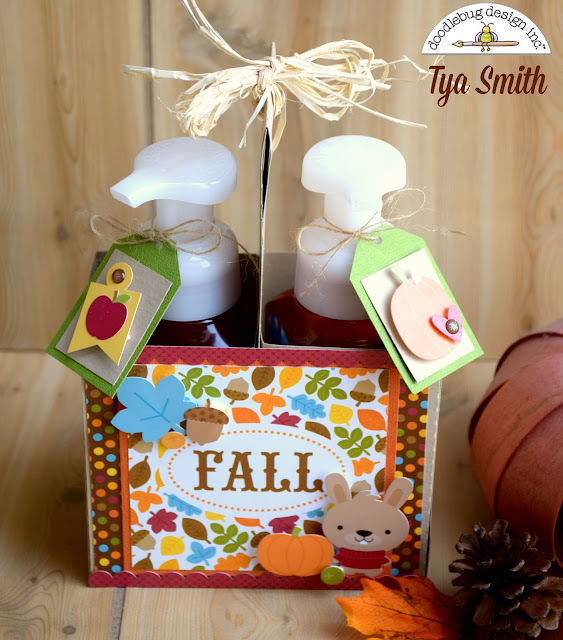 Hello Doodlebug friends - it's Tya here to share with you my project using the adorable new Fall Friends line. 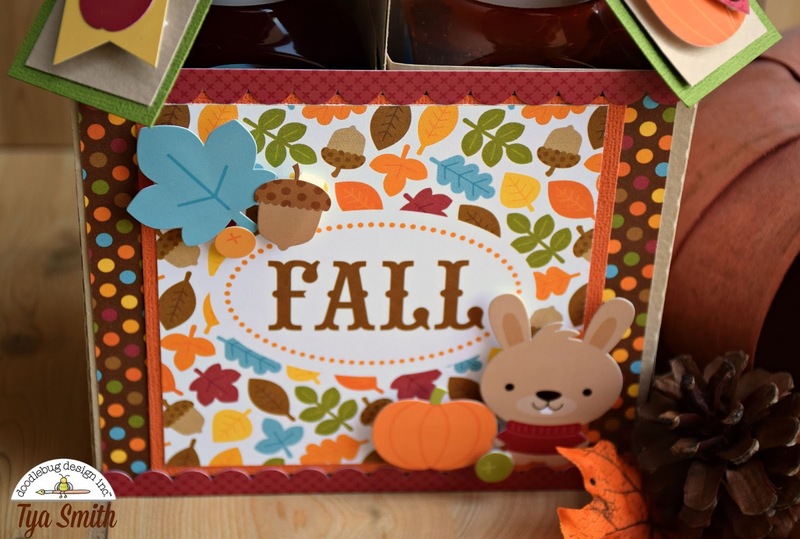 It is such a fun and festive line and after creating this project I am SOO ready for fall to be here! So the first true sign of fall to me is when all the fall scented products start coming out. 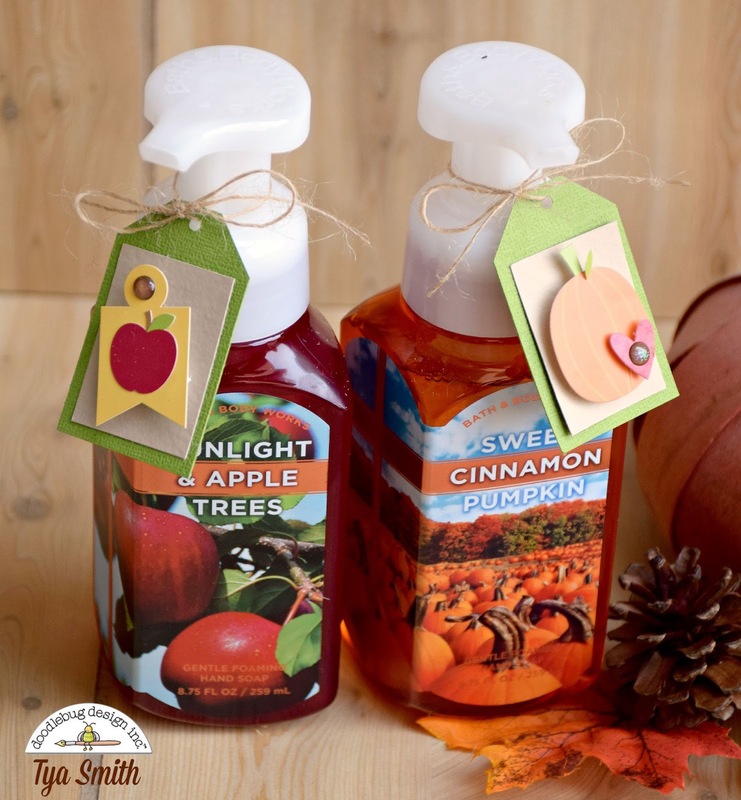 I stopped by my local Bath and Body Works and picked up a few fall scented soaps and decided to give some away to my cute sister in law who just bought a new house. I wanted to put the soaps in a cute little carrier so I hunted a file down to use with my Silhouette Cameo that would work. I found this 3D Two Handled Drink Carrier and the soaps fit perfectly. I followed the instructions on this blog Bits of Paper by designer Jamie Lane. It was so quick and easy and I love how it turned out. I used some Doodlebug Textured cardstock for the box base, a sheet of pattern paper for the front and I cut out one of the 4x4 squares from another one of the papers and added this to the box front. I added a cute little bunny, a pumpkin , leaf and an acorn sticker from the icon sticker sheets for some added fun. I mounted the Fall title on a piece of orange cardstock. I also added a red scallop sticker border from the Fancy Frills sheet along the top and bottom of the box front. Using some green cardstock, I cut two little tags and then added a few other stickers and glitter sprinkles to the tags. I tied the tags to the soaps with some twine for a little rustic feel. So that's all there is too it! I love giving gifts and when I use my Doodlebug products I know that my recipient can't help but love them! Hopefully I have inspired you to create a fun fall gift for a special someone in your life. Happy crafting! I Love this Tya!! Such a great idea! I know I said it already, but I love this idea!!! What a fun container all jazzed up in Doodlebug Finery!!! Love that you have captured the essence of Fall with the scents and sights of the season!! So amazing and do full of rich, deep Fall hues!!! Tya did such an awesome job on this - So perfect!!! Great project Tya ... such a cute idea for a gift too!